Few American singers can match the ferocity, as well as popularity, that Katy Perry brings to her music. From swooning love songs, to bass bumping hits, Katy Perry has a catalogue full of unique songs. Katy Perry has become well known in the music world for her singles, as well as her well selling albums. She has also become known for her changing looks, as her appearance is constantly being worked on, to appeal to her fans. Here is a brief overview on some of the changing looks that Katy Perry has gone through in changing her looks. After releasing her second album, One of the Boys, which featured such hits like I Kissed A Girl and Hot n' Cold, Katy Perry was further solidifying her status as a high selling recording artist. The album was released in 2008, and for most of the year, Perry sported a curly hair, that was a little bit shorter than her usual look. Here is a picture on 2008, at the MTV Latin Music Awards. During 2009, however, her look changed, with a longer, straighter hair style. Her hair was more sleek, and she sported a very stern expression in this photograph at the MTV Music Awards in 2009. For Katy Perry, 2011 was a big year of many changing looks. During this year, her hair color was pink, blue, purple, blonde, green, and many other colors. While some of these looks were derived from wig choices, many of them were dyed hair colors. 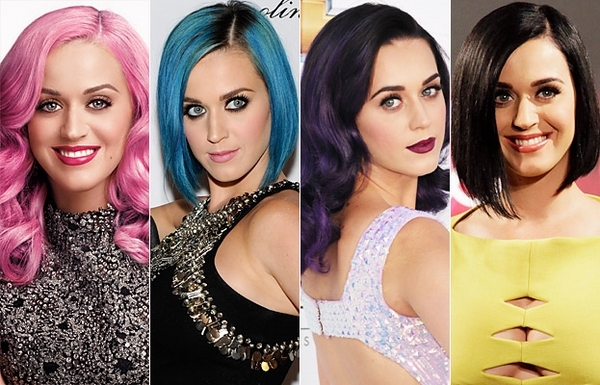 Below are some of the numerous hair choice colors that Katy Perry had during the vibrant year of 2011. As you will see on the next page, 2011 held many different color changes for the hit pop singer, many of which were in support of her film The Smurfs, which was also released in 2011.